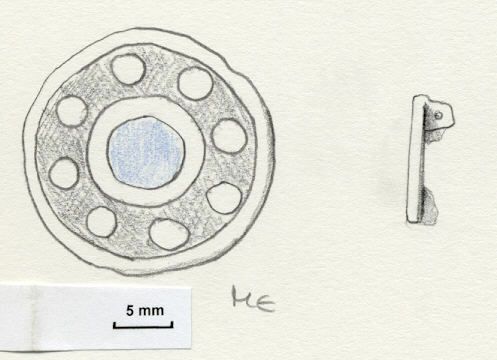 Flat enamelled disc brooch, central ring still with remains of blue? enamel, outer ring with eight! discs on dark blue or black ground. Traces of surface tinning. Checked by MF following Sophie Catley. Dating completed [unamended]; drawing ref. added. Hattatt, R., 1982 Ancient and Romano-British brooches Sherborne: Dorset Publishing p.344,1029. Oval plate brooch with recessed bands, central recess empty, outer band with blue green enamel. Traces of tinning. Disc, light blue enamel. Remains of pin fittings on back, 2. Central ring surrounded by six rings with central dot . Oval disc brooch, banded surface. Nothing in central recess, outer band with traces of black enamel.